For dissemination to be considered as ‘open’, reuse of a project’s output, be it data, presentations, video or articles, would be explicitly encouraged. One way of showing people that your materials are “open” and can be reused in specific ways is to openly license them. One type of open licensing is Creative Commons. There are different Creative Commons licenses that allow the rights owner to choose which rights to reserve and which to give away. License options are explained on the Creative Commons website. School of Open also has a course called Get CC Savvy that helps you explore and understand the different Creative Commons licensing options available. 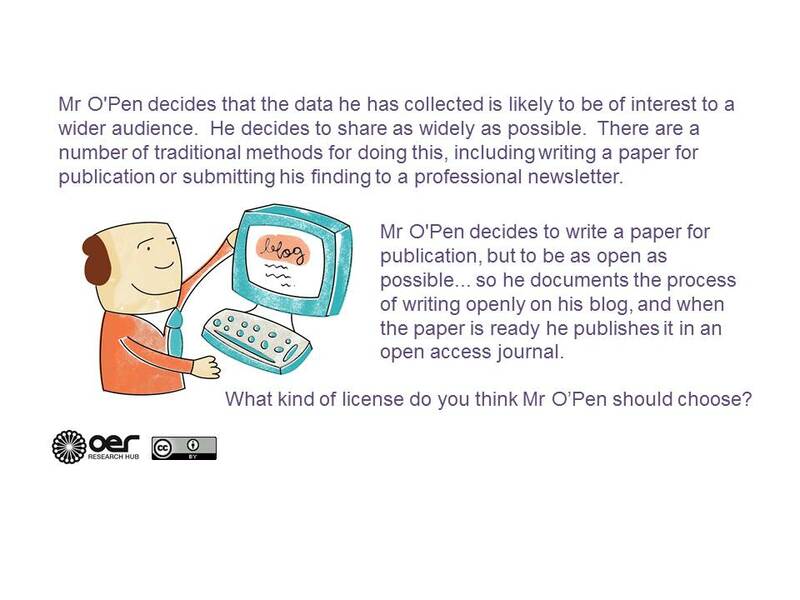 You can see some of the more detailed arguments about particular licenses on this School of Open course Why Open? (scroll down to the links under the heading Arguments about benefits and drawbacks of specific Creative Commons licenses). You can also read more about how to license different types of research outputs (for example data or databases) in the guidelines available via the Creative Commons wiki. Choose one output you have created or are planning to create –i.e. a presentation, blog post or a framework document. Consider which Creative Commons license you would use. Review others' contributions. What do you think are the advantages or disadvantages of someone else’s choice? Share your thoughts in the Discourse forum and comment on at least one other post. Why your project would prefer a particular license over another.